I’m in the great state of New Jersey today for the annual ENOCH convention, telling people about WriteAtHome. 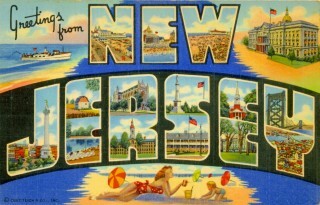 I was born in New Jersey and spent my early years here, so I thought I’d post something Jersey-themed. This one of the few poems I have laboriously committed to memory. I’ve never read any of her many books, but she has numerous best sellers, mostly her romantic adventure stories featuring bounty hunter Stephanie Plum. All of these books have clever numerical titles: One for the Money (1994), Two for the Dough (1996), Three to Get Deadly (1997) through Explosive Eighteen (2011). Prolific writer most famous for historical fiction, like April Morning, about the battle of Lexington and Concord from the perspective of a teenage boy. Clark is a prolific and popular writer of mystery and suspense novels. A two-time pulitzer prize winner, Mailer helped forge the New Journalism movement in the 1960s and started The Village Voice in 1955. Probably his best known book is The Executioner’s Song, a fictionalized account of the life and death of murderer Gary Gilmore. Another writer of popular fiction, Ms. Plain sold more than 30 million copies of her books. Perhaps the most honored novelist in the modern era, Roth has won the National Book Award (twice), The National Book Critics Circle award (twice), the Pen/Faulker Award (three times)and a Pulitzer Prize. Subscribers to our blog get a weekly email with links to all our recently-published articles. Click the button in the upper-right hand corner of this page to subscribe now!